Recently I heard a true story about a lovely girl called Julia. She lived all her life in fear of instant death as she was born with a heart problem and spent her life waiting for a heart transplant. Doctors could not find a heart that matched hers. She kept this secret to herself, thus limiting her life while creating a lot of tension, anxiety and fear. Then, one day she unexpectedly received a phone call informing her that a young woman, who had died suddenly in an accident, had donated her heart, which matched her DNA. They asked her to go immediately to the hospital. Her life changed completely after that day. She was now a new person and the fears and anxiety caused by her condition simply disappeared. This is an image of the Resurrection of Christ. This is precisely the uniqueness of Christianity: the emphasis on life – Christian life and eternal life. Easter is a passage, from death to a life radiating hope, peace and energy, so that the new life of Christ transforms the world. Recently, the shocking results of a survey came out. In the UK, every week around 80 men under the age of 40 commit suicide, making it the highest form of male mortality in the UK. It reveals a shocking truth – so many people live their life in despair. When we speak about the Resurrection, we are speaking about hope, and new life available for people who live in the shadows of death. The Easter celebrations starts with a new fire, a new light that illuminates the darkness of the night and warms the coldness of this age. The new light shifts the moods of desperation and of restless hearts to the warmth of the peace of the Risen One. Easter comes in spring, as it aims to connect what happens in nature with what happens in the soul. People can live a desperate life alienated by work and engulfed in pain, grief and sorrow. People can live the drama of life all by themselves in desperate loneliness, trying to fill the void with addictions and with the anaesthetic of work and a busy life. In the Gospel of St John we see the disciples running from the tomb to the upper room, and while still surprised by what had happened they give this unbelievable good news to all. These disciples, Mary Magdalene and the disciple Jesus loved could now see with different eyes. Love became the paradigm by which they penetrated and transplanted the new reality. This hope can heal our wounded world from depression, sadness and death. Only through the eyes of love and the witness of discipleship can meaning penetrate the darkness of the world. The promise of a new heart and a new spirit can be proclaimed. The Resurrection becomes the cornerstone of a new reality by which the fear of death could be redeemed and the freedom of children of light can illumine the darkness of existence. In the Apostolic Creed, an enigmatic line summarises this reality. We proclaim that “Jesus des­cended to the dead”. It is a phrase full of depth as it illustrates that no one can go to heaven before being lifted from the fear of death and the place of darkness. Only by penetrating these dark places can the gift of the peace of the Risen One liberate people and give them the freedom of a new heart. 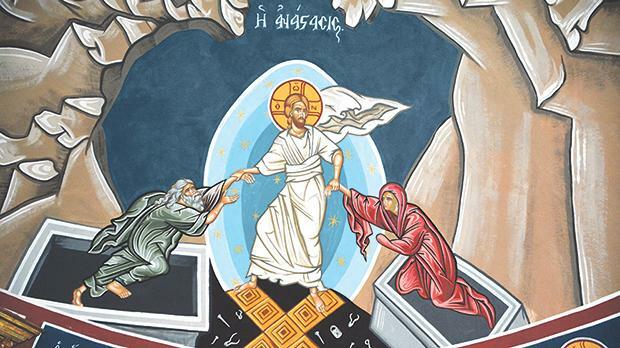 Like the beloved disciple, we must run forth from the empty tomb into the cenacle of people’s life and tell the whole world that “He is truly risen”. There is a new way of living life, and a new heart is feely available to all. It matches the DNA of humanity, and our anxiety and restlessness can be transformed into a new and living hope. Our mission, like that of the doctor in the story, is to make that phone call telling others of the availability and the urgency of this good news. Fr Martin Cilia is a member of the Missionary Society of St Paul.